As work is not everything what matters, the city tries to make life colourful every single day and at any time of night. Irrespective of taste, preferences and interests, here everyone can find something for themselves. Bydgoszcz is a city full of charm and appeal. It astonishes visitors with its originality and creativity. Here we can find interesting buildings from the old times, many sacred objects and places meant for entertainment and relaxation. The 18th meridian of eastern longitude runs through Bydgoszcz. 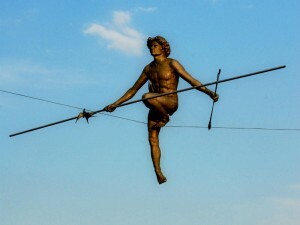 The meridian crosses almost through the centre of the Old Market Square, and connects Bydgoszcz with such cities as Stockholm and Cape Town. Here is Poland’s largest city park, the city is beautifully situated on the Brda and the Vistula Rivers, important roads and trails crosses here. Bydgoszcz – the pearl of Art Nouveau – provides a unique opportunity to walk through the streets and admire beautiful architecture. The Old Town owes its exceptional shape to an outstanding architect Józef Święcicki who designed many of the buildings, including the corner tenement house at Plac Wolności Street or the famous “Pod Orłem” hotel. What is more, a residential district “Sielanka” with a Registry Office which has witnessed many emotional moments, or a music district surrounded with parks, monuments and cultural objects account for an exceptional architectural atmosphere of the city. 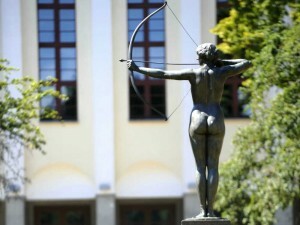 The famous Bydgoszcz “Archer Lady” and the “Deluge” fountain- monument – both created by Ferdynand Lepcke are the most characteristic symbols of the city. 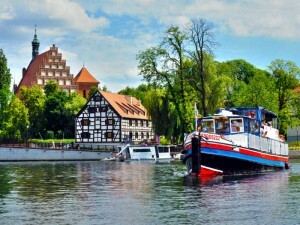 The Mill Island is one of the most beautiful parts of Bydgoszcz, often called “the Heart of the City”. It is frequently associated with Amsterdam and is also referred to as “the Bydgoszcz Venice”. River banks, water dams, cascades and green areas make it a perfect place for a walk. Due to museums and an opera house located nearby, the Mill Island is frequently a venue for various cultural events. Bydgoszcz is also characterised by its beautiful churches, cathedrals, temples and sanctuaries, e.g. St. Martin and Nicolas Cathedral built in late Vistula gothic style, the Bernardine Church which is one of the oldest historic buildings in the City, the Klaryski Church – a small but beautiful Gothic-Renaissance object, or St. Vincent de Paul’s Basilica which resembles the Roman Pantheon. Bydgoszcz owes its unique character not only to beautiful buildings, but also to the sound of water, dams, sluices, bridges, riverbanks and boulevards. Located between two rivers – the Brda and Vistula River and connected to Odra River, it is an important point on two international waterways. 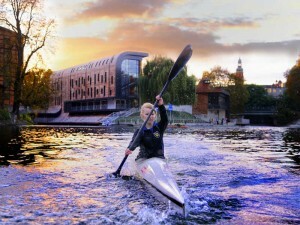 The Bydgoszcz Canal, which is a part of the Bydgoszcz Water Junction, is undoubtedly a true technological monument. The Brda River reflects the facades of historic buildings and modern architectural forms. It is a unique place for oarsmen, canoeists and café barges. Well-developed waterways foster the development of water tourism. From Bydgoszcz, one can travel almost everywhere. Bydgoszcz is a perfect place for resting after work or spending a weekend. The city offers excellent hotels. Guests can choose from modern and historic buildings, three, four, five star hotels are located in the heart of the city. The centre of Bydgoszcz is full of restaurants, pubs, clubs and cafes. In the Old Market you can taste specialities of various cusines: Italian, Greek, Old Polish, Turkish, ou can try great pancakes and molecular dishes. While strolling through the Old Town you should try some of the several kinds of beer that are brewed in the premises located beside Mill Island. Bydgoszcz is proud of some very interesting museums. One should certainly visit the European Centre of Money, the so-called Leon Wyczólkowski’s House, both on the Mill Island, Exploseum situated in the Bydgoszcz Primeval Forest and the Museum of Land Army Forces. The city on the Brda River boasts great music traditions and has a lot to offer to music lovers. 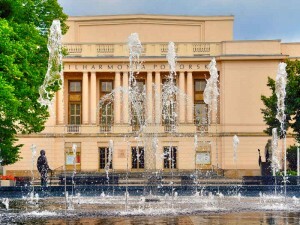 A concert in the Pomeranian Philharmonic Hall, performance in the Opera Nova, plays in the Polish Theatre or an evening in one of the many music clubs in Bydgoszcz are the perfect ways to spend some time in the city. Bydgoszcz is surrounded with green areas. It is often called the “green city” and is the second greenest city in Poland. Tourist trails, a multitude of natural reserves, the Tuchola Forest and Koronowski Reservoir are located around the City. We can also visit Las Gdański or the largest city park in Poland – the Forest Culture and Leisure Park “Myślęcinek” which covers an area of 830 hectares and includes the Polish Fauna Garden, the Botanical Garden, Horse Leisure Centre and an amusement park. Copyright © 2015 - 2018 Bydgoska Agencja Rozwoju Regionalnego Sp. z o.o.